Tomorrow is Good Friday, it’s a “day of fasting” and traditionally we don’t eat meat on that day. Actually we rarely eat meat on a Friday at all because my mother in law almost always cooks fish and welcomes all of her children and her extended family to dinner that day. So much so that it has been renamed “Fresh Fish Friday” in our house. When growing up Good Friday the “stations of the cross” along with Ma in our parish church, then a trip to the graveyard in Sutton to visit the grave of my Grandfather (her husband), after which we’d head over to Howth to get fish fresh from the pier. There was, and still is, only one shop on the pier where we buy our fish and that is Nicky’s Plaice. Fresh fish can be expensive, particularly if you choose expensive cuts such as fillets or “steaks” of salmon, likewise with cod, haddock or other white fish. However there is no need to spend a fortune on expensive cuts if they are going to end up in a pie. The most important thing to remember is your fish should be fresh and come from a reputable source. One of the things that we are very concious about is saving money and so when making a pie I simply ask for tail pieces or offcuts which normally end up in the bin. Once home I pick over the pieces to make sure that there are no bones or sinew then cut off any skin, give the fish a thorough wash to remove any residual scales and cut into chunks. I call this pie “Buried Treasure” for the kids because I fill it with jewels (peas and sweetcorn). When I made this pie first I put crisps (chips for those from the US) on top to bribe the kids into eating it. I’ve kept that tradition because it adds a salty, crunchy texture to the pie. When I made this pie yesterday I was out of Tayto Cheese & Onion flavour which is normally the best choice, and so substituted for smushed up Hula Hoops Ready Salted instead and it was equally as crunchy and delicious. Peel and chop the potatoes into equal sized pieces. Place into a large pot, cover with water and boil until cooked through. Drain the potatoes, leaving them in the pot pour 50ml of milk over the top, wait for 2 mins for the milk to warm then mash. Cover the mash then leave to one side. In a small pot melt the butter on a medium heat. When melted stir in the flour and keep on stirring until it starts to sizzle and cook. Add 50ml of milk then stir well until it is well mixed. It normally goes into a thick clump with the flour at this stage. Add another 50ml of milk and repeat until all the milk is mixed in and you have a thick sauce which coats the back of your spoon. Turn the heat to the lowest possible setting on the hob and then pour your chunks of fish into the sauce. Leave for 6 minutes then add the frozen vegetables. Leave the pot on the hob for another 4 minutes to allow the vegetables to warm through then pour the sauce into the large ovenproof dish. Cover the sauce with the mashed potatoes, crumble the crisps on top. For an extra punch grate a strong chedder on top of the crisps if you like. If feeling virtuous eat with a green side salad. We just like to eat with a spoon! Hey, just finished a helping (and a half) of the Fish Pie with a few alterations. I used a small bit more fish (about 400g) which cost €5.70 from local fishmonger. I also sweated off a very small amount of onion in the melted butter until soft but had no colour on them. I also par-boiled some carrot and added to the sauce. Had no breadcrumbs so made some scale-like impressions on the mash and covered in thin layer of grated cheese. Fish included was Cod, Haddock, Smoked Haddock and Gurnard. I think next time (and yes I WILL be making this again) I will add some more Smoked Fish to enhance the flavour some more. I also added in some finely chopped parsely to the sauce and small bit of white pepper into it. I would guestimate that the total cost the dinner was about €7.00, and will either do two of us a substantial lunch, or a dinner, tomorrow. 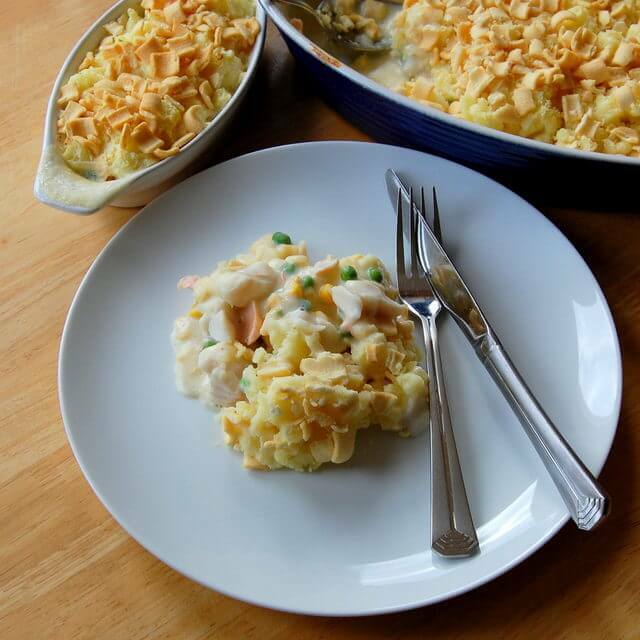 Great value me thinks and so annoyed with myself that I hadn’t gotten onto this Fish Pie lark ages ago!! E I’m delighted to hear it was so successful & I’m also pleased that you’ll get more than 1 meal out of it. It’s perfect comfort food. Enjoy! This looks and sounds so good ! I must admit I am partial to the odd crisp sandwich so I must try this. The boys think it is the coolest thing. An actual dinner that contains crisps….genius ! As a parent you do what you can to get them to eat a decent dinner. I think a small amount of crips on top of an otherwise extremely nutritious and healthy fish pie is a small price to pay!